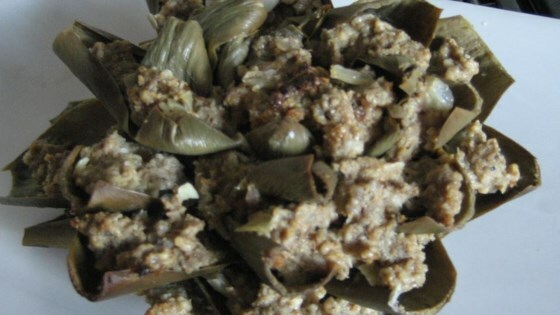 "When I was child, my mother often made these meat loaf-stuffed artichokes. They're a nice change from traditional stuffed peppers. - Jean Castriota, York, Pennsylvania"
Rinse artichokes well; trim stem. Cut 1 in. off the top. Snip the tip of each leaf with a kitchen shears. Brush cut edges with lemon juice. Spread artichoke open. Using a small knife, carefully cut around center choke. Scoop out and discard the fuzzy center. In a saucepan, place artichokes in a steam basket over 1 in. of boiling water. Cover; steam for 20-25 minutes or until crisp-tender. Invert on a paper towel to drain. In a bowl, combine the eggs, milk, ketchup, bread crumbs, basil, parsley and garlic. Crumble beef over mixture and mix well. Stuff meat mixture into center of artichokes and between leaves. Place in an ungreased 11-in. x 7-in. x 2-in. baking dish. Combine tomato sauce and water; pour over top. Cover and bake at 350 degrees F for 1 to 1-1/2 hours or until meat is no longer pink. These were delicious and so moist. Best recipe I had and my family loved them. This was SO YUMMY! I used the exact recipe and was extremely pleased at the final result and presentation was phenominal :). Thank you! This was phenomenal!!! I wasn't sure how it would was very work out, but, I was very pleased. I have added this to my menu at home. Artichoke is a pain to core and I used my regular meatloaf recipe, but finished product was great! I used much more garlic and had only one egg. I supplemented it with more milk instead. I forgot to mention that I did not use the tomatoes at all...just water in the bottom of the pan.